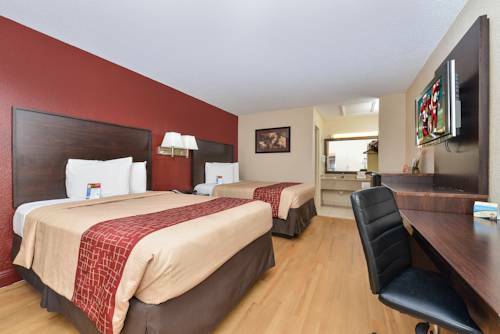 Whether youre traveling on business or vacation, you will be delighted by the comfort and cleanliness at the Red Roof Orlando South - Florida Mall. We are conveniently located 10 minutes from the Orlando International Airport, downtown Orlando, and Orange County Convention Center, and are within walking distance to the Orlando Florida Mall, the largest retail center in Orlando. Were the perfect base to explore all of Orlandos great attractions, including Disney, Sea World, Universal Studios, LegoLand, Gatorland, Holy Land, and Islands of Adventure. If you like to shop, besides Florida Mall, were also convenient to Premium Outlets and Millennium Mall. Were also close to Kennedy Space Center, Daytona Beach, and the Citrus Bowl.